Another one takes the plunge… A good friend of mine name Betty Gathers had been contemplating the “Big Chop” for some time. She’d watch videos, read blog posts and ask questions, educating herself on the process. She’d call, we’d talk about it and she’d go back to watching more YouTube video’s of individuals who had done the “Big Chop”. After going through that process for a while, "She finally did it"! And here are her thoughts and a few questions I asked about her hair and her journey to the “Big Chop”. Me: What made you decided to get Sisterlocks ® in your hair? Me: What made you decide to do the "Big Chop"? Mrs. Betty: I was just ready for my hair to be loose. 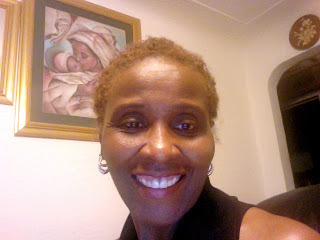 I wanted to feel my hair and embrace it… I just got “that burning desire” to do it! Me: Are you excited about your new hair journey? Mrs. Betty: Yep!!! I am… I’m excited about learning my hair texture and how to properly take care of it. Me: What advice would you give other women who are contemplating the “Big Chop”? Mrs. Betty: You need to really educate yourself, be around supportive people and be confident… And don’t worry about what somebody else is going to say. I guess Mrs. Betty had decided that enough was enough and made the “Big Chop”! She did it after much research and soul searching… Making the “Big Chop” is a “Big Decision”! For some, it’s a “Big Relief”, and for others, it’s the start of a “New Beginning” with learning and embracing your natural hair texture. Whatever your decision is for making the “Big Chop”, Celebrate It! FREE To BE Who You Were Naturally Created to BE. Yes I am free and loving it. I need to get to know my hair. A friend that already big chopped told me the best way to learn your hair is when it is short and growing. Now I am learning the products to use on it. I do not want to become a product junkie. I also do not want to spend tons of money on hair products and some one else doing my hair. Maybe once a year go to some one to clip ends and deep condition. A little TLC with some one else doing your hair for the day. At this time I just have the basics products. Eco Gel, Giovanni's deep moisture conditioner, Olive oil, and Olive oil spray. Yes this is a journey and I will always be available to others that have questions. Now that we have all this information and support our journey should be so much easier of taking care of our natural hair. Young women I am so proud of you of picking up the torch and knowing that we are beautiful with the hair that we were born with. God makes no mistakes. Thank you for giving me the opportunity to share in your "Big Moment"! It's truly a blessing to have witnessed this process with you. I "WILL" to you the Healthiest Natural Journey to Discovering, Understanding and Celebrating Your Natural Hair Texture and LOVING YOURSELF ALL THE MORE!! !